Today was our final day at International House. We were supposed to have a small party with the students and then a party with the teachers. The plan for the day was in stark contrast to how the day actually went. We were SUPPOSED to start our party at 3 pm. Of course people in Mexico are awesome and the first beer was cracked at 1 pm and they already had the salsa music going. 🙂 We had a whole mess of snacks. Someone brought olive tapenade with crackers, plantain chips and I brought some pork skins. All of the chips and pork skins were doused with liberal amounts of hot sauce. 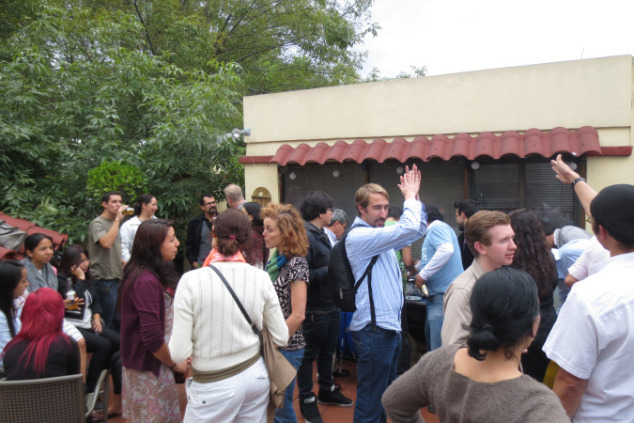 At one point it started raining, which is typical for Mexico City, and even THAT didn’t stop the party! Hah. Here we have Francisco, myself, Rebecca, Siomara and Eduardo. Francisco is in biomedical research and travels a lot for his job. He was involved in taekwondo growing up and spent last year in Thailand practicing Thai boxing. Siomara studied Economics and spent last year living in Paris. Eduardo wants to become an English teacher and also loves baking cakes. 🙂 Such a fun bunch. His favorite recipe is called agua fresca. It is a combination of chia seeds, sparkling water and lime. Halfway through the event, the Director of IH, Ariel Lopez, made an announcement to the candidates. He offered congratulations on completion of the course and best of luck in the future. He also mentioned that International House Mexico was ranked one of the top three IH schools in the world after London and Barcelona. So fantastic. Things wrapped up around 9 PM when the school finally closed its doors. It was to sad to leave, but we know that this is not goodbye. We will all stay connected via e-mail and contact each other whenever we need teaching advice. We also know this is just the beginning of our new adventure in teaching ESL. Couldn’t be more excited to see what the future holds for our CELTA family. 😀 Let the games begin.